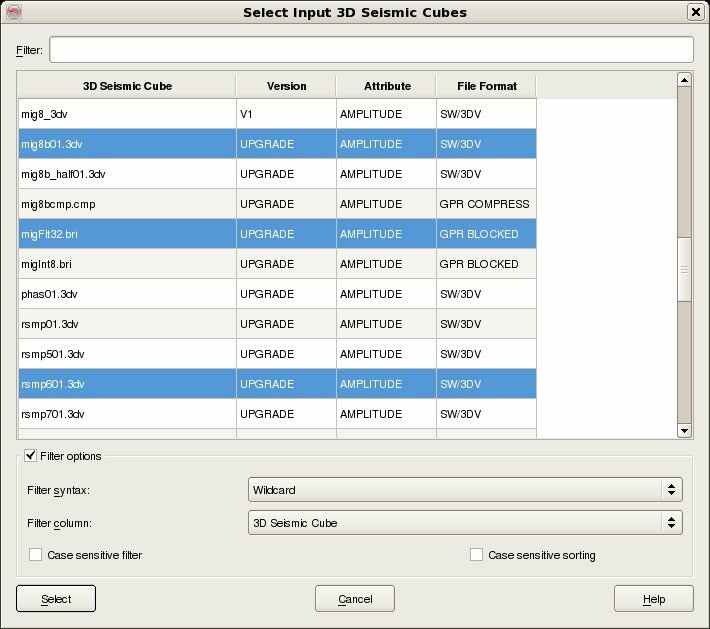 To import 3D seismic data, select Survey - Import - SeisWorks - 3D. 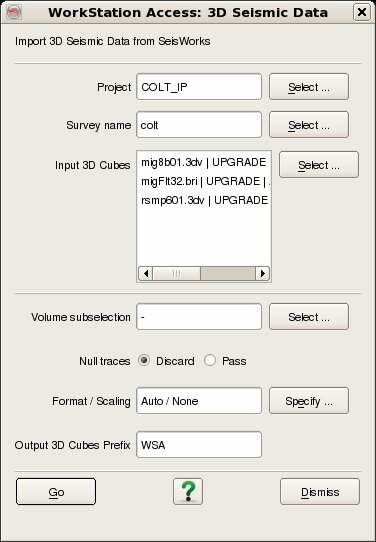 The top part of the user interface corresponds to the SeisWorks access, where it is needed to specify the SeisWorks Project, Survey name and select the Input Cubes that you wish to import (For multiple selection of cubes hold the Ctrl key while selecting). Seismic data volumes are selected by two data keys, Name and Version. The data selection dialog also displays the Attribute and the File Format for information only. To filter the list enter the required Filter into the text field at the top. It is possible to filter on any of the four available columns by changing the Filter Column to whichever is desired. The default Filter syntax is Wildcard which means that the list is automatically filtered to only list items who's Filter Column includes the string entered into the Filter field. Other Filter syntaxes supported are Fixed Field and Regular expression. Case sensitive filtering and Case sensitive sorting are also optionally supported. The Volume subselection dialog is a standard dialog used when importing and exporting a volume, line, or horizon, copying a cube or horizon, or processing an attribute. All: This last option will output the maximum number of trace with respect to the available data and possible stepouts. The Format / Scaling dialog allows optional formating and scaling to be applied to the data. Storage: OpendTect supports can store data internally in 8, 16, 32 and 64-bit seismic data formats. 8 bit signed has a data range between -127 and +127. 8 bit unsigned ranges between 0 and 255. Similarly 16-bit signed ranges between -32767 and + 32767 (unsigned 0 - 65535). Per default the data are stored in the same byte-format as the input (Storage is set to 0 - auto). 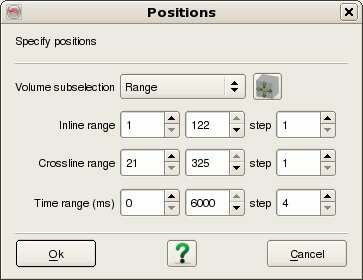 Adjust z range to survey range: With this option, the user can adjust his/her new scaled seismic to the survey range. Optimize horizontal slice access: For better performance in loading time slices, set this option to Yes. This compromises some speed in loading crosslines, but loads time slices significantly faster.